Abstract: In this chapter, a methodology for the optimal management of combined water supply and navigability/sustainability in river systems based on model predictive control (MPC) is proposed. A control-oriented modeling methodology for this type of systems is presented as well. MPC is used to generate flow-control strategies from the sources to both the farmers and urban consumers in order to meet future demands with appropriate flows, optimizing operational goals such as network safety volumes in dams and smooth operations of actuators (valves, gates and pumps). At the same time, the generated flow-control strategies should allow maintaining the appropriate river water levels that, in turn, allows to preserve the ecological flows and the navigability of the downstream part of the river. 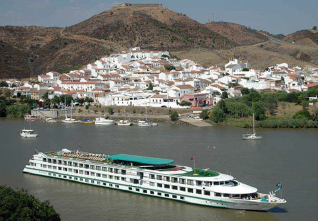 The case study of the Guadiana river is used to show and verify the proposed optimal management methodology. Reference: V. Puig, C. Ocampo-Martinez, R.R. Negenborn. Model predictive control for combined water supply and navigability/sustainability in river systems. In Transport of Water versus Transport over Water (C. Ocampo-Martinez, R.R. Negenborn, eds. ), Springer, pp. 13-33, 2015.